A brief overview of Savile Row, how bespoke and made-to-measure suiting differs from ready-to-wear and what the future of tailoring could look like. 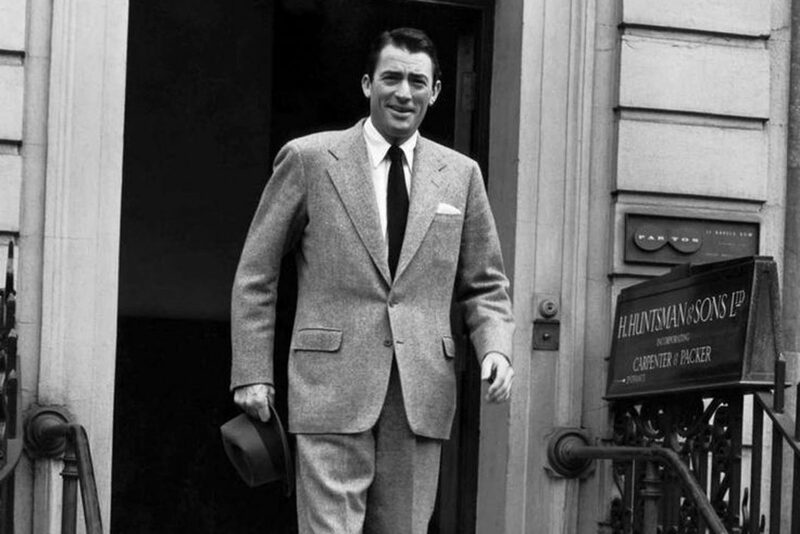 Gregory Peck leaves H. Huntsman & Sons at No. 11 Savile Row. That small street in London’s Mayfair, which is world-famous for tailoring, started life between 1731 and 1735. Constructed as part of the new Burlington Estate, it was named for Lady Savile and was originally a residential area, but by 1805, the first tailoring firm had taken residency and the bespoke trade flourished through the 19th century. The proximity of Savile Row to the Royal Court provided a market for robes, uniforms and all matter of finery, from formal to hunting dress. Savile Row as we know it today, however, began with Henry Poole, which moved to No. 37 in 1846 from its original premises on Old Burlington Street. The tailoring house, which specialised in military wear, was known for its innovation and is credited with creating the first dinner jacket, for none other than King Edward VII, while he was the Prince of Wales. Renown for Savile Row continued to grow over the next century, which saw new and already established houses open up shop on the street: Norton & Sons opened in the 1860s; Dege & Skinner opened at No. 10 in 1865; Anderson & Sheppard hung up a sign at No. 13 in 1906; Hawkes & Co, which later became Gieves & Hawkes, moved to No. 1 in 1912; H. Huntsman & Sons moved to No. 15 in 1919; T & F French merged with existing Savile Row tailor A.H. Kilgour in 1923. While Savile Row is entrenched in tradition, the London address has had its fair share of disruptors. At the turn of the 20th century, the structural style of the previous two centuries was challenged by Frederick Scholte and Anderson & Sheppard, who created and championed what was to become known as English drape: natural shoulders, a high armhole and a generous vertical roll through the chest. In 1969, Nutter’s of Savile Row opened at 35a; the first new firm for generations, it was the first shop on the Row to have a window display and blended contemporary design with top-drawer craftsmanship. 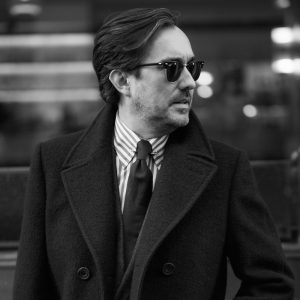 With the patronage of rock stars and a thirst for publicity, Tommy Nutter – together with Edward Sexton, Roy Chittleborough and Joseph Morgan – created a brand with an appeal beyond the traditional Savile Row customer. “We were the original designers”, explains Sexton. Before fashion brands existed and could create seasonal collections, new styles and silhouettes were created bespoke. Archive pieces from Savile Row have influenced, and are still influencing fashion. Ralph Lauren, Tom Ford and Hackett have all looked to Savile Row for style inspiration. I have worked around Savile Row for almost 20 years and have had the pleasure of knowing some extremely talented artisans, who still remain today. There is a genuine love for the craft on the Row and a passion for product. The ability to create something three-dimensional from a flat piece of cloth and a paper pattern is a blend of art and science. A common criticism of ready-to-wear tailoring from tailors is that it looks 'flat' and 'lifeless'; this is due to a combination of construction, pattern and pressing (or lack thereof). A 'proper' Savile Row suit is created by attaching the various layers of cloth and lining with hand-stitching and a great deal of work with a steam iron; High Street suits can be glued together in minutes and pressed flat to allow for cheap shipping. In saying that, many Savile Row tailors now offer products beyond bespoke, in order to stay relevant in today's fast-paced retail environment. Brands such as Huntsman and Edward Sexton offer ready-to-wear and brands like Gieves & Hawkes and Chester Barrie create complete collections to rival the large Italian houses. The homogeneity of the High Street has also influenced Savile Row – customers now expect stitching to be uniform and clean, as opposed to the tell-tale variation of hand-stitching. Where a traditional bespoke suit would only have a single inside chest pocket and unlined trousers to 'hang better and hold a better crease', it's commonplace to now find suits with numerous inside pockets and lined trousers thanks to demand. And what about the future? Michael Browne of the eponymous firm believes that the increased rents and costs of operating in Savile Row will eventually alter the dynamic, with only the larger houses being able to survive. And they will need to offer ready-made and made-to-measure to complement their bespoke offer. Browne believes that many of the values that Savile Row was renowned for will eventually fizzle out, but it will remain a mecca for men’s tailoring. There will always be a customer who will pay for the best. And whilst we are on the thorny issue of price, Savile Row may not be cheap but it genuinely offers value for money. Without giving away any trade secrets, I can honestly reveal that the profit margin on a Savile Row suit is significantly lower than almost any other luxury product at a similar price. Dominic Sebag-Montefiore is optimistic about the future and how, at Edward Sexton, ready-to-wear can complement bespoke. “This isn’t about putting our label into a generic suit” explains Dominic, “but about using our skills and expertise to create something special. Our Hollywood-top trousers, for example, were the result of a bespoke pair I made for myself but were admired by so many customers we tried them off-the-peg. We have a close relationship with our customers and we know how he likes to wear his cloths and his lifestyle.” What Anderson & Sheppard has achieved in its beautiful Clifford Street store is the perfect example of this. “Tailoring will survive”, says Robert Leach, academic and author of the Fashion Resource Book, “but it will be less Savile Row-centric.” Leach would like to see a return of the local independent tailor offering alterations and repairs, as well as bespoke. Leach is also remaining optimistic: “Look at (what has happened to) barbers and male grooming.” Only a few years ago, a proper wet shave with a cut-throat razor was only available by appointment in a few West End establishments – now it seems almost every UK town has a 'proper barber' offering traditional grooming services at an affordable price. This has not been at the expense of the top end. There will always be a market for the best – and Savile Row needs to be the best to survive.